Paradise means something different for everyone. For some it’s the unadulterated tranquility of a white-sand beach on some forgotten isle, for others the hustle and bustle of a neon-metropolis on a Saturday night. For an eight year old, maniacal Star Wars fan in 1986, paradise was the back of a dingy arcade in Perranporth and a pocket full of ten-pence pieces. 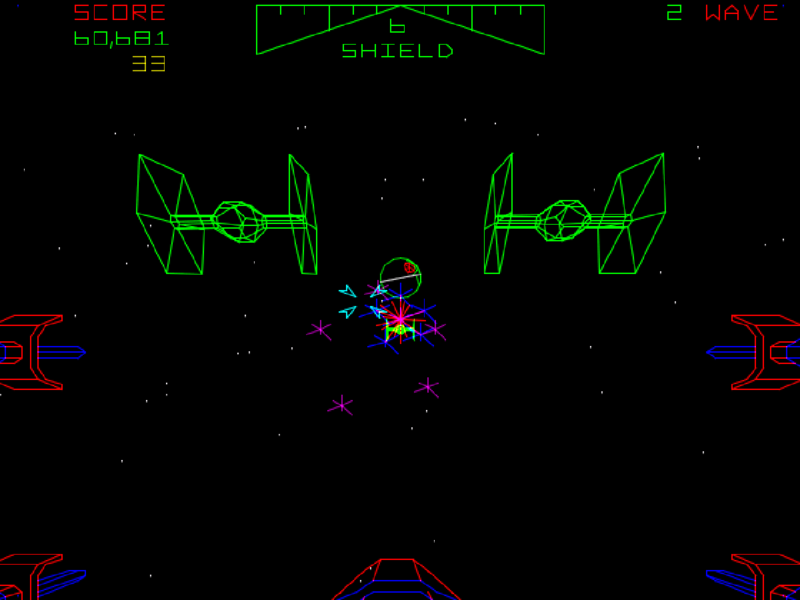 For it was there I discovered Atari’s Star Wars arcade game, the greatest movie tie-in ever committed to silicon. Why was it paradise? What makes this game so good? Well, the single clinching factor has to be atmosphere. So many great films have been the victim of abominabal tie-in games, purely because developers often overlook the tone and feel of the film. In the cinema Star Wars was exuberent, fun and breathtaking in its pace. The arcade game followed this pattern beautifully. Ignoring all that guff about princesses and lightsabers, Atari cherry-picked the highlight of the entire series – the assault on the Death Star – and built their game around that. As such, you’re thrown in at the deep end, cannons blazing and shields crackling as you approach that monstrous metal moon in your X-Wing. Tie Fighters swoop down from all angles, raining laser-fire down upon you. Between swooping through the enemy ships, blasting them to pieces and shooting fireballs out of the sky, you barely get a second to breathe. I remember it still, the first time I got through that initial wave. Hands clasped nervously around the wonderful analogue controller, fingers itchy, arms at full stretch because it was the full-size seated cabinet and I was, after all, only eight. While flitting over the Death Star’s surface blasting laser turrets was fun, nothing prepared me for the clammy, cold terror of the trench attack. Lasers hurtling at the screen, bridges and catwalks to dodge and, of course, the classic (and rather Freudian) denouement of slamming a torpedo into the portal and watching in awe as the Death Star was obliterated before my eyes in a hail of colour. Again, the speech. This time Han Solo. “Great shot kid, that was one in a million”. I truly believed it was. I was a rebel pilot. I was Luke Skywalker. Sinking back into the oversized chair, I was breathless. Then, suddenly, it began again. Only this time faster, more intense (George Lucas would indeed be proud). Just like its celluloid ancestor, this continual cycle of attack, evasion and oblivion never, ever gets boring. Never loses its appeal. Is never anything less than one of the finest videogames ever created. Of course, having said all this, gushed for all I’m worth and generally hurled superlatives about with gay abandon, there are a couple of issues that, returning to it as an adult, I simply can’t ignore. No matter how much I want to. For instance, there’s the way the game uses ‘the Force’. Just as you start the Trench run, Obi Wan’s ghostly voice echoes around the cabinet. “Use the Force, Luke”. To be honest, at eight years old, I had no idea what to do, so I just blasted everything and set my sights on punching a huge hole in that portal with my torpedoes. However, the more astute player will have figured out that the developer was encouraging them to “use the Force” by not firing at anything, relying purely on your reactions to get you through the Trench and take your single shot at the portal. Success was rewarded with a huge bonus. Then there’s the home experience. Or lack thereof. To say that the game benefits from its cabinet is to understate the issue quite significantly. It would be like saying that a fish benefits from water. Yes, it’s true, but it’s also somewhat wide of the mark. The entire experience is reliant on the environment. Cocooning yourself in that dark, low-slung cabinet; the flight wheel before you with its bright-red twin-triggers; the speakers beside your ears belting out that famous theme and wowing you with its scorchingly accurate laser fire and screaming TIE fighter sound effects. Once you’re out of that environment, even using the alternate stand-up cabinet, the game starts to lose some of its atmosphere, the very thing that makes it so brilliant. Even worse, try playing one of the home versions. While the Amiga, DOS and Atari ST versions maintained the frantic energy of the arcade game thanks to mouse-based controls; the 8-bit versions were terrible to control, the game really not suiting either joystick or keyboard control. Combined with the muddy visuals which did nothing to capture the vibrancy of the arcade’s vectors, the sluggish controls made the 8-bit versions quite unpalatable. Sadly, however, even the superior 16-bit versions couldn’t hold a candle to the magnifcence of the arcade experience. Visually and aurally, they were close, but the ambience was definitely missing. Thundering across the surface of the Death Star in a sit-down cabinet at the back of a murky arcade in the mid-1980s is inifinitely preferable to doing the same thing years later in your bedroom, on your Amiga, with a backdrop of Garfield wallpaper (yes, really) and disappointment. Still, none of this detracts from the brilliance of the sit-down arcade cabinet which, as a gaming experience, is second to none. Exciting and gripping gameplay, visuals that perfectly suit the subject – capturing the ‘feel’ and ambience of the original films, and managing to make the most of limited 80s technology to produce visuals that just don’t age – and that wonderful sampled speech make this, in my opinion, the finest movie to game translation of all time. Who says computer games can’t do spectacle as well as the movies? Not me, that’s for sure. There’s no doubt about it, this was the moment when I got hooked on games. Star Wars Arcade started me down a road that would lead me to spend more time, money and energy on this hobby than I probably should have. Okay, okay, definitely more time, money and energy than I should have.